I’ve always tried to be ethical in my reviews that I do for the NosillaCast. If I’ve received a unit or software for free, I tell you that up front. I also tell you that I believe my reviews are not influenced by whether I paid for a product or not. Human nature probably causes a shift even for me, but I fight against that instinct. I have received truly awful software in the past, and some bad hardware, and in those cases I simply don’t do a review at all. Instead, I send feedback directly to the vendor with specifics on what they need to improve before I would consider talking about their product. This week I was approached by a company, which shall remain unnamed, to have the opportunity to review their newest hardware. I’d worked with the company before and did indeed have a “little friend” there. The little friend had suggested that I be one of the people to get a free unit for test. I was excited to do it because I’d truly liked another product of theirs. But when the official invite came, it was not an offer I could accept. The offer was this: I buy the unit from Amazon with my own money, then I write an Amazon review. I take a screenshot of the review, and send it back to the company and then they’d reimburse me for the cost of the item. Yeah, that would be a no. I was told that it didn’t have to be a good review, that I could say what I really thought. But doesn’t that whole deal sound icky? Doesn’t it sound like an approach that would really cause people to send in only good reviews? My own ethics would not let me comply with this request, but I didn’t have to rely on my own internal sense of right and wrong. I went hunting and as I suspected, this is against the guidelines for Amazon reviews. Amazon used to allow incentivized reviews but stopped that practice back in 2016. A company called ReviewMeta conducted a study of over 7 million reviews on Amazon and looked at the effect of these incentivized reviews. I love data analysis as much as the next girl so I thought it was really interesting. indicated that the average rating for products with incentivized reviews was higher than non-incentivized ones. (That is, a 4.74 average rating versus a 4.36 average rating, out of 5 stars). 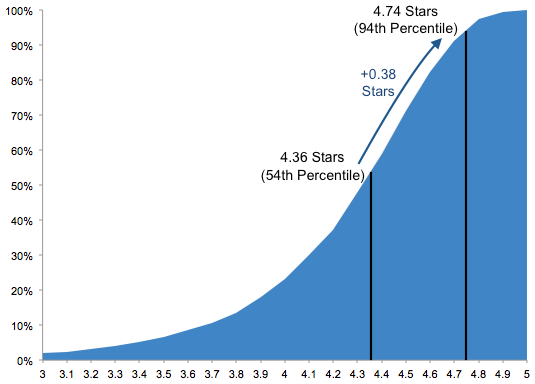 That difference of .38 stars doesn’t sound huge, but that small change moved products from an average of 54th percentile to 94th percentile! ReviewMeta dug even deeper. Since 7 million+ reviews have to be across vastly different products, they looked at products that had at least 10 incentivized reviews and 10 non-incentivized reviews. That gave them a sample set of 251 products with a total of over 600K reviews. With this control in place, the spread was less but the incentivized reviewers till gave .29 starts higher on average. 86% of products received a higher average rating from their incentivized reviews than non-incentivized reviews. One of the times Dr. Garry was on CCATP to talk about memory, we discussed the fallacy of self-perception. We talked about a few studies that have been done that show that well over 50% of drivers believe they’re better than average drivers. This study really gives me pause on whether I’m truly unbiased when I receive products for free. I have made the choice to accept products for review for free, and I don’t plan on changing that. I suggest you look at my reviews of free products with an even more critical eye than usual based on these numbers. I’ll do my best to be unbiased, and perhaps I’m one of the few who are not, but that’s probably self-delusion, don’t you think? After I posted this story, George from Tulsa reminded me that Amazon does have a method for reviewers to be able to write reviews and receive free products. The program is called Amazon Vine, and the idea is to help new products get up in the rankings but for it to be done in a way that isn’t sullied by the ethical questions. Amazon chooses people to participate in the program by looking at their reviewer ranks (do they get a lot of positive upvotes for their reviews). They call these people Vine Voices. Then companies provide products to Amazon which they give to the appropriate set of Vine Voices for that product category. As I read about this program I’ve realized that Amazon is basically getting people to work for them. That’s cool, of course, but I prefer to have my own voice on my own platform. Tying your enjoyment on the Internet to any one platform often ends in sadness for you when the rules change and your platform disappears. George and others challenge my rule that I don’t review truly bad products. I understand his point, that he wants to make sure NosillaCastaways don’t buy bad products they could have avoided. I haven’t changed my mind on this though. It takes a lot of time effort to write the reviews I do, so to write up bad products would mean that I’d have to go through them step by step, be fair in pointing out what isn’t bad about them and then suffer through the bad parts in detail. That doesn’t sound like any fun at all to me. I volunteer to do this for you guys, and having fun is my main goal! I think it would be an interesting podcast theme though, to only review bad products! I would’t listen to it though.